The halachic parameter of mishloach manos ish l’rey’eihu (the minimum gift we must give to fulfill our basic obligation) is set at “two gifts to one person.”1 These two gifts must be two different minim and must both be given to the same person. The poskim raise the following question about mishloach manos: If someone gives a gift that otherwise fulfills the Halachic parameters (two different minim given at the same time to one person) but he puts the two items in the same kli, does he fulfill his obligation to give mishloach manos? The Ben Ish Chai2 rules that in such a case you have not fulfilled your obligation, because the fact that they are in one container means that they are considered to be only one gift. The Ben Ish Chai cites Shabbos 91b to support his psak. The Mishnah there states that if someone puts a basket full of produce on the edge between one reshus and another on Shabbos, even if most of the produce in the basket has been moved into the second reshus, he is patur since some of the basket and its produce remain in the first reshus. So long as the basket and its contents have not been fully moved into the second reshus, one has not violated hotzaah; one has not been “motzi” it unless one is motzi all of it. The gemara there records a dispute as to the specifics of the case in the Mishnah. Chizkiyah contends that the Mishnah’s ruling is only true if the produce in the basket is something like gourds or cucumbers, which are long objects, because in such a case, if part of the basket is still in the first reshus then perforce each object in the basket remains at least partially in the first reshus. R. Yochanan, on the other hand, contends that the ruling would hold true even if the basket to be filled with seeds and entire objects in the basket would be in the second reshus. Chizkiyah, however, would hold that one transgresses hotzaah if the basket were filled with seeds, as entire objects have been moved from the first reshus into the second reshus. Their disagreement can be understood as follows: R. Yochanan holds that the basket ‘binds’ (me’aged) all of the objects in it together into one unit. Therefore, it is inconsequential whether or not each and every object in the basket remains at least partially in the first reshus – the question is whether or not the basket remains at least partially in the first reshus. Chizkiyah, however, holds that the basket does not have this ‘binding’ property. Therefore, we must focus on the individual objects in the basket. If any one of the items in the basket has been totally removed into the second reshus, then the owner has violated the prohibition against hotzaah, even though part of the basket and some of the items in it remain in the first reshus. Based on these sources, the Ben Ish Chai posits that the same holds true with mishloach manos – if you put two objects into one basket, the basket ‘binds’ them together, meaning that halachically they are considered one object. Consequently, to fulfill one’s obligation of mishloach manos, one must put two distinct manos into two separate containers. Rav Shmuel Halevi Wosner zt’l4 disagrees with the psak of the Ben Ish Chai. 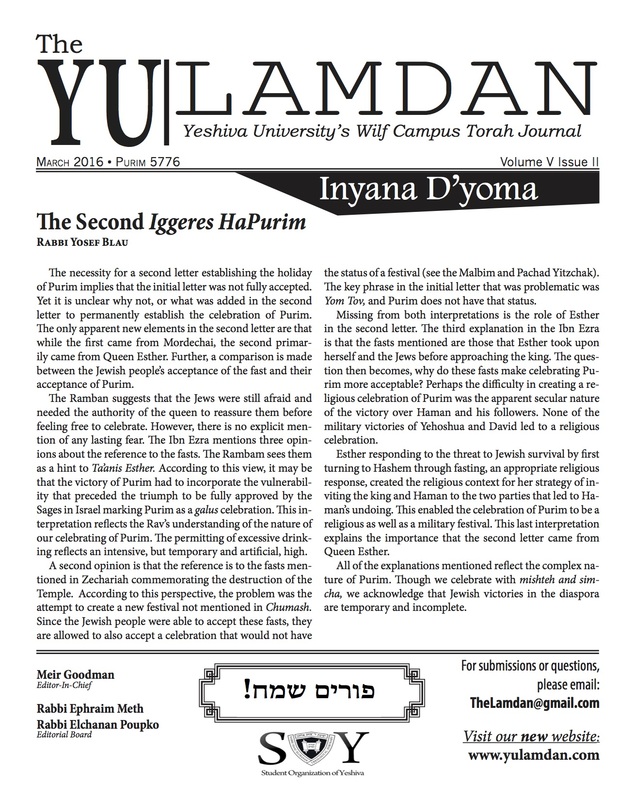 Rav Wosner writes that it is perfectly acceptable to fulfill the obligation of mishloach manos with two gifts in one basket. Indeed, as Rav Wosner points out, this is actually a normative way to give mishloach manos in our day. Rav Wosner’s psak seems to be based on the following conceptual distinction between our case and the case of hotzaah on Shabbos. In hilchos Shabbos, the operative question is “was he motzi the object?” If we understand that the kli was meaged its contents, then we only look at the basket itself, not its contents, to answer that question. That doesn’t mean that everything in the kli is one large cheftza, however. It merely means that we judge violation of hotzaah based on the kli rather than the objects in it. Therefore, one has not transgressed the issur hotzaah until one has moved the entire basket. That doesn’t mean that everything in the kli is one large cheftza, however. It merely means that we judge violation of hotzaah based on the kli rather than the objects in it. With mishloach manos, on the other hand, the question is “how many gifts did he give?” The basket is nothing more than a receptacle – we look inside it to see how many gifts are being given. It seems that even according to the Ben Ish Chai, there might be room to say that in certain situations, one actually might be able to fulfill their obligation of mishloach manos even by sending two gifts in one container. As established earlier, the Ben Ish Chai’s position is based on an application of the concept of egged kli shmei egged to the case of mishloach manos. Rav Yitzchak Zilberstein shlit’a (Chashukei Chemed, Megillah 7b) points out that the Tzafnas Paneach writes that egged kli shmei egged is only true with a kli chashuv, whereas with a kli she’eino chashuv, the kli is batel to its contents. Based on this, Rav Zilberstein suggests that the Ben Ish Chai would only say that you aren’t yotzei your chiyuv of mishloach manos when the kli is a kli chashuv. If that is correct, then presumably many of the throw-away cheap plastic holders that people use to send mishloach manos would not be a problem even according to the Ben Ish Chai.